"Repairs and resolves many different types of errors on your hard disk." 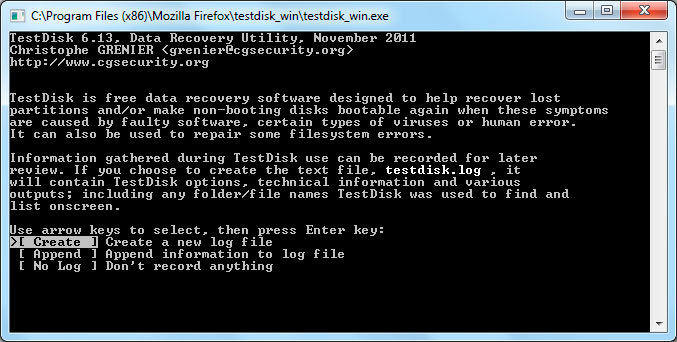 TestDisk is a powerful hard drive recovery and repair utility in command lines. While a powerful tool, it might be more for advanced users since this tool does not come with a graphical user interface (GUI), but rather just a simple to use Command Line Interface (CLI) that, with the right amount of knowledge, will allow you to fix what you want on the hard disk that is in question and is the reason why you are using TestDisk. We can recover deleted data partitions or start-up sectors in any of the most used formats on Windows systems, for example NTFS, FAT (16 and 32) and Unix file systems like ext 2 and 3. TeskDisk is a free and open sourced, which means you can use this powerful tool at no cost to you and only to your benefit. With it being open sourced, you can expect it to always be very stable and up to date and able to be used with the newest version of Windows when they are released. TeskDisk can also make non bootable disks bootable again when symptoms are caused by faulty software and certain types of viruses or human error, for example accidentally deleting a partition table. Having this software available just in case something unexpected happens that you wish to get back to normal relating to your hard disk partitions, TestDisk can most likely get you back up and running. This software can also be used to collect detailed information about the corrupted drive you are using TestDisk for. All of this information can then be sent to a technician for further analysis if you cannot decipher the information yourself. However, of course, if you are knowledged enough on the matter, the information can also be used for your own benefit and help you diagnose any issues with your hard disk by yourself. For these reasons, TestDisk can be very useful for you. This application queries the BIOS or the operating system you are running it on in order to find the data storage devices such as your hard disk, memory cards, etc and their characteristics such as LBA size and CHS geometry. There are many things you can use TestDisk for, these include recovering a deleted partition, rebuilding a partition table, and rewriting the Master boot record (MBR) on your hard disk. All of these uses can fix many issues, small to large, on your hard disk. Of the many things you can do, TestDisk also does a quick check of the disk's structure and compares it with the partition table for entry errors while then doing a search for lost partitions of many different types of files system for Windows and Unix based operating systems. Having as many options with TestDisk, while still remaining a free application, is of the many reasons to give it a try.